I am so pleased to announce my being chosen to participate in the Found Poetry Review’s OULIPOST challenge for National Poetry Month, 2o14! As such, I will be writing a new poem each day, in the tradition of Oulipo and sourced from the day’s news–as reported in the New York Times and the Baltimore Sun–and posting them here on the blog. Each of the 82 poets involved were asked to answer a few questions, as a means of introducing OULIPOST and those of us engaged in it. My answers follow below. I hope you will enjoy checking in each day and following my completely non-linear “progress”. Feel free to leave me feedback! 1. WHAT EXCITES YOU ABOUT OULIPOST? I am excited to have to step outside of my traditional (more formal; worked, then reworked and then worked again) methods of production. I am also excited for what this will yield in terms of the end results. 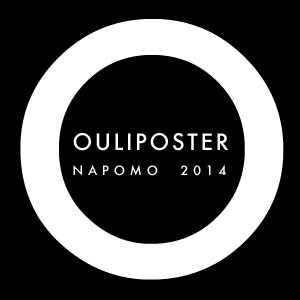 I’m also excited by the group dynamic inherent in the project, to be inspired by the work of the other OULIPOSTers and how they generate it. Finally, I’m also excited about being asked to find my inspiration in alternative spaces, mainly in what’s happening in the world around me in terms of current affairs, as well as what the mainstream media is choosing to call our attention to. 2. WHAT, IF ANYTHING, SCARES YOU ABOUT OULIPOST? I’m also afraid of getting in to trouble at work for just wanting to work on the poems throughout the day! 3. HAVE YOU WRITTEN EXPERIMENTAL OR FOUND POETRY BEFORE? IF SO, TELL US ABOUT IT. I was introduced to experimental writing in graduate school, the likes of Ben Lerner, Ingeborg Bachmann and Christian Bök; I was dubious at first, but it didn’t take long for me to come around. I am also obsessed with writing poems based on the scraps sent in to FOUND magazine! My first “experimental” poem seemed to open many doors for me around Baltimore, once I had the courage to share it with others. 4. WHAT NEWSPAPER WILL SERVE AS YOUR SOURCE TEXT? I’ll be using the New York Times, with a little help—if necessary—from the Baltimore Sun. 5. WHO’S YOUR SPIRIT OULIPIAN? My spirit Oulipian is Jacques Jouet. He, like me, works in several forms and media, including collage. He is also responsible for “Poèmes de métro”, of which I am severely fond! Also, he is the only “J”!